Ergonomic levers help to reduce operator fatigue and a color coded lever system allows for easy operation. 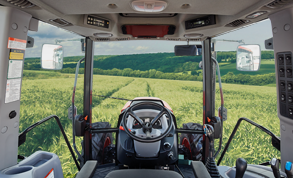 A wide windshield gives the operator a panoramic view for increased visibility. 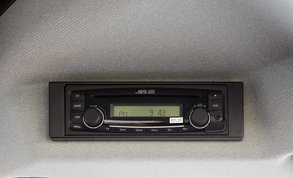 Enjoy a day at work while listening to the standard CD player with AM/FM radio. 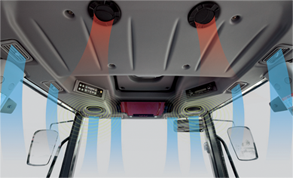 Climate control ensures comfortable working conditions for the operator throughout all seasons. The power shuttle provides softer shuttle operation and allows easy loader operation work without depressing the clutch pedal. 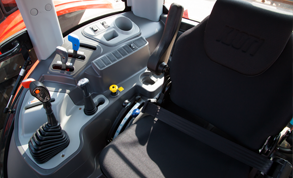 A tilting instrument panel and steering wheel allow the perfect fit for each operator. 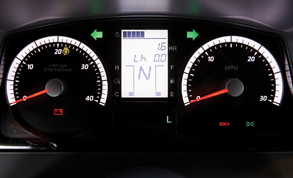 Instrument panel is illuminated for better visibility in lower light situations. Smooth gearshift lever for the 32 x 32 transmission. 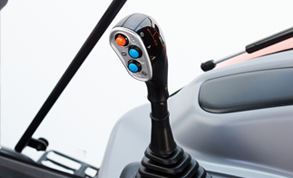 By using the hand clutch on the PX Series, the main gear lever can be shifted without using the clutch pedal. 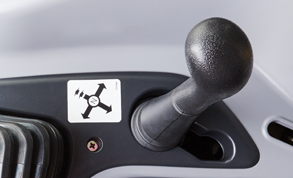 The operator can select the "hi" or "low" speed of any gear by simply pressing a button on the lever. 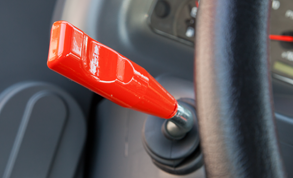 The conveniently located joystick lever reduces operator fatigue when using implements. 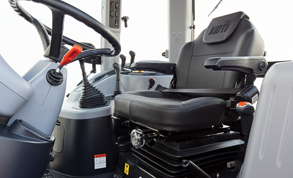 A fully adjustable suspension and swivel seat allows the operator to ride in comfort no matter what the task may be. 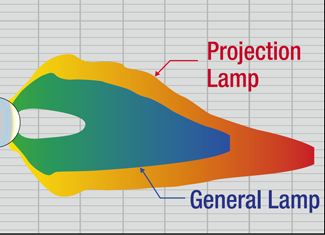 Newly designed headlights allow the operator to work safely in low light conditions. This allows for increased accessibility to components for easy maintenance and inspection. 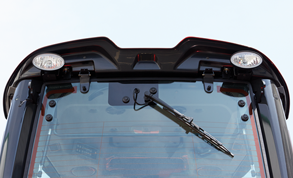 The front windshield wiper is positioned lower for clear and unobstructed visibility for the operator. 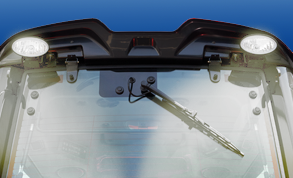 The rear window wiper improves visibility even when working in reverse by keeping the window clean from rain and dust. 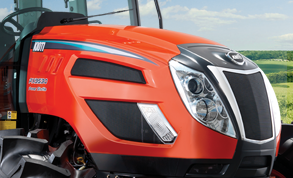 With rear adjustable working lamps, the operator can maneuver safely in low light conditions. 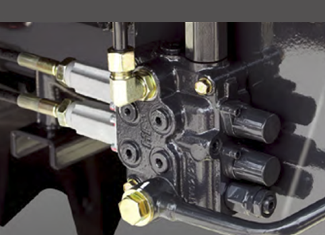 The standard joystick valve includes two sets of forward facing hydraulic valves to accommodate easy loader installation and operation. The PX Series comes standard with dual remote hydraulic valves to accommodate a wide variety of attachments and implements. 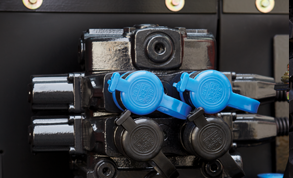 PX Series tractors offer an optional third remote hydraulic valve. 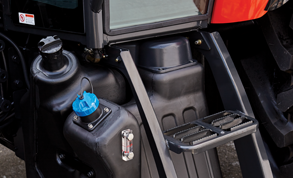 The 34.3 gallon (130 L) fuel tank increases productive work time without the needs for frequent re-fueling. Our History 1986 The first KIOTI compact tractor was introduced in the US. 1993 Daedong-USA, Inc. was formed and KIOTI Tractor was headquartered in Wilson, NC. 1999 Introduced DK45, the first DK Series compact tractor. 2000 Introduced KL Series loaders, KB Series backhoes and KR Series grooming mowers. 2002 Expanded implement line to include mid-mount mower, tiller and bale spear. 2003 Expanded implement product lines to include aerator, rotary cutter, rake, box & rear blade and more; Introduced CK20, the first CK Series compact tractor. 2004 KIOTI opened the new North American headquarters in Wendell, NC; Introduced CK25, CK25 HST, CK30 and CK30 HST. 2006 Introduced DK45SE HST, the first DK SE Series tractor with advanced technology. 2008 KIOTI Introduces the 4 Year Industry Leading Warranty. The DK75 utility tractor is introduced. 2009 The DS series economy tractors are introduced. The DKSE series is expanded to 10 tractors. 2010 KIOTI introduces the DK45SE Cab, DS4110HS, and the DS4510HS. Implement line is introduced, including 3-point tillage equipment, mowers and UTV attachments. 2011 KIOTI introduces the MECHRON 2200 Utility Vehicle, CK Series Compact Kab, DS3510 and the first RX series tractor, the RX6010C. 2012 KIOTI Introduces the CS2410 Subcompact Tractor and the RX6010PC utility tractor with Hydraulic Power Shuttle. 2013 KIOTI introduces the new CK2510 & CK2510HS. The new NX series is announced which includes 45HP – 60HP Cab models available with Synchro Shuttle & Hydrostatic Transmission. The new RX Series models ranging from 66 – 73HP available with Synchronized, Power Shuttle and Power Shuttle with Creeper Transmissions and a choice of ROPS or Cab. 2014 KIOTI announces the completion of an extensive update to its parts warehouse in an effort to increase efficiencies and better serve customers and dealerships. NAEDA awards KIOTI with Gold Level Status for exceptionally high dealer rating levels as part of NAEDA’s Manufacturer recognition program. The First PX model is announced, the PX9020. The first DK10 Series models are introduced, including the DK4510/H, DK5510/DK5510/H. New NX ROPS models are introduced ranging from 45HP - 60HP. 2015 New utility vehicles are introduced, including the MECHRON® 2200PS & MECHRON® 2240 2-Row Utility Vehicle. NAEDA awards KIOTI with Gold Level Status for exceptionally high dealer rating levels as part of NAEDA’s Manufacturer recognition program. KIOTI debuted four new CK10 Series models, including the CK3510/H and CK4010/H. 2016 KIOTI celebrates its 30th Anniversary in North American. 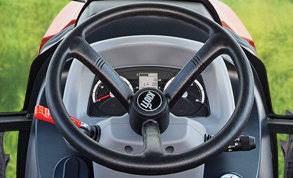 KIOTI expands the Field Option Cab Series to suit new and existing models in the CS Series, CK10 Series, DK10 Series, and UTVs. A new drive-over mid-mount mower compatible with the CK2510/H was introduced. The CS2210 and CS2510 were added to the CS Series sub-compact line. The EDA awards KIOTI with Gold Level Status for exceptionally high dealer rating levels as part of their Dealer-Manufacturer Relations Survey. 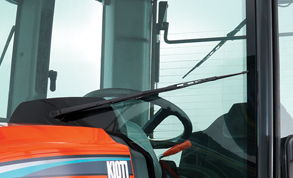 KIOTI Tractor introduces new line of industry-leading implements. KIOTI Tractor adds the PX9530PC, PX1053PC and PX1153PC Models to the PX Series. 2017 Daedong Industrial Celebrates its 70th Anniversary. KIOTI Tractor introduces two new models to the CK10SE Series, the CK3510SE HC and the CK4010SE HC. 2018 KIOTI Tractor expands utility vehicle product offering with new K9 Series UTV. KIOTI Tractor adds new ROPS models—the CK3510SE, CK4010SE, CK3510SE HST and CK4010SE HST. KIOTI Tractor adds four CAB models - the DK4210SE HC, DK4710SE HC, DK5310SE HC and DK6010SE HC KIOTI Tractor adds four ROPS models—the DK4210SE HST, DK4710SE HST, DK5310SE HST and DK6010SE HST. KIOTI Tractor invests $13M in expanding its North American Headquarters. KIOTI Tractor opens its Canadian Distribution Center. There are currently no implements for this product.